The switchgear (SWGR) and motor control centres (MCC) considered in this section are those found in the onshore and offshore oil industry for supplying power to processes and utilities. Extra high voltage (EHV) transmission and distribution equipment used by electricity authorities is not considered herein. Hence most of the equipment used onshore and offshore is limited to an upper service voltage of between 11 kV and 15 kV. Occasionally voltages in the range of 30 kV to 40 kV are used when the incoming line or generating capacity exceeds approximately 120 MW. Voltages as high as 69 kV are used for long submarine cable systems. The SWGR and MCC equipment are invariably housed in a building or enclosed module, or at least effectively protected against bad weather and aggressive environmental conditions. The construction is therefore of the metal clad type, in which all the live parts are housed in a mild-steel sheet metal enclosure. The enclosure is sub-divided so that personnel may work safely on some compartments without danger or the risk of electric shock. Various degrees of personnel and ingress protection are commonly available. The degree of protection is defined in various international standards e.g. NEMA and NEC in USA, IEC in UK and Europe. For use inside buildings where manual operation and interference is infrequent and where the atmosphere is cool, dry and clean an enclosure of the IEC60529 type IP40, 41 or 42 or NEMA type 1 or 2 is usually adequate. If equipment is to be located in a poor atmosphere e.g. dust laden, damp, hot and where hose-pipes may be used to wash down adjacent plant, then a more demanding enclosure type is required e.g. IP54 or NEMA type 4, but this would normally only apply to low voltage equipment. Fuses for MCC outgoing circuits. Electrical protective relays and devices for all power circuits. Communication or network interfacing system. Main connections and terminal compartments. Switchgear tends to be operated infrequently, whereas motor control centres operate frequently as required by the process that uses the motor. Apart from the incomers and busbar section circuit breakers, the motor control centres are designed with contactors and fuses (or some types of moulded case circuit breakers in low voltage equipment) that will interrupt fault currents within a fraction of a cycle of AC current. Circuit breakers need several cycles of fault current to flow before interruption is complete. Consequently the components within a circuit breaker must withstand the higher forces and heat produced when several complete cycles of fault current flow. 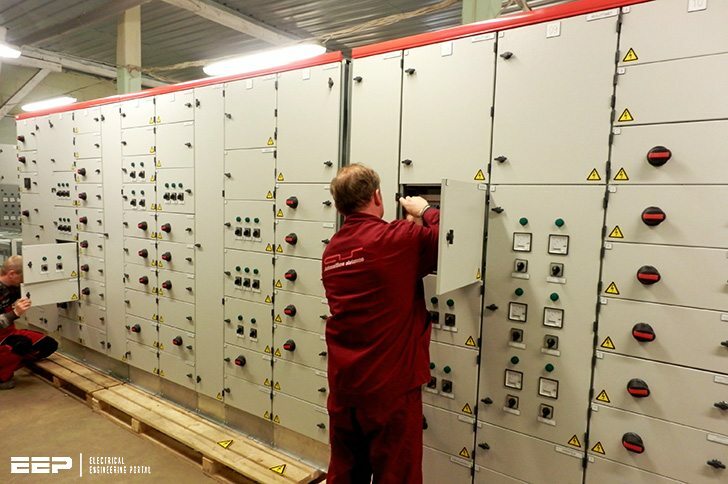 Switchgear is available up to at least 400 kV, whereas motor control centres are only designed for voltages up to approximately 15 kV because this is the normal limit for high voltage motors. I am reading EEP past one and half year.This portal is way of heaven and ocen of electrical technology to deserved electrical engineer. I am very much thankful to EEP and their staff.